Looking for a little romance? This romantic dinner cruise is perfect for honeymoons, anniversaries, or couples looking for a special night out. 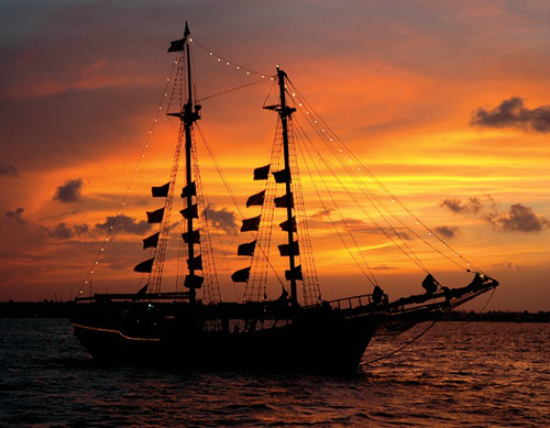 Escape the maddening crowds and enjoy this beautiful cruise on the Nichupte lagoon aboard a Spanish galleon ship. Live music and open bar will accompany your delicious meal. Choose a lobster dinner, a surf and turf meal, or the vegetarian option. Open bar includes wine, beer, soft drinks and water. You can choose the sunset cruise or the moonlight cruise and sail along for as you wine, dine and dance in the company of your loved one. Why not surprise your loved one with this special night out? Contact us and we can help you plan it! INCLUDES: Domestic open bar. Choice of lobster dinner, surf n’ turf dinner, or vegetarian dinner. Menu choice to be indicated at the time of booking. Your meal choice comes with baked potato, vegetable and dessert. HINTS AND TIPS: Wear sensible shoes as you will be on board a boat. You may want to bring a light sweater if you tend to get cold. Bring extra money for tips, souvenirs and your port tax. NOTE: Children are not permitted as this is an adults only oriented excursion. Age 14+ only. WHEELCHAIR: This tour has limited accessibility for wheelchair users. Contact us. RESERVATIONS: Please reserve at least 1 day in advance. There is a $6US port fee per person to be paid at the dock. Departs daily from the Aquatours Marina daily at 5:00pm and 8:00pm. Please arrive 30 minutes prior. If you are outside the Cancun area – you can add transportation once you are making the booking. $10 per person up until the Flamenco Xcaret, $15 per person anywhere south of there.